Both of these fellas are generally acknowledged as the best in the business at what they do, but who is the best mentor/coach/Yoda figure out of these two? Steve Peters - The man credited with bringing in his famed 'chimp theory', 'marginal gains' and various other buzzwords that sound cool on paper but rubbish in reality to the green baize of snooker. Responsible for bringing Ronnie O'Sullivan from the brink of career death to the heights of World titles and countless other accolades. An ever-present and key part of Team Ronnie, alongside his assistant Damian Hirst. Jack Trump - The new man of the moment and has shown that brotherly love does indeed conquer all. His influence cannot be understated, managed to somehow do the impossible and take his aimless brother by the scruff of the neck and turn him from a wandering, arrogant wannabe to the new dominant force of snooker. What he actually knows about snooker is debatable and frankly can probably be written down on a first class postage stamp, but that is irrelevant. Judd Trump is now playing snooker to a level never seen before and only one man is responsible for that - Jack Trump! Last edited by Cloud Strife on 11 Feb 2019, edited 1 time in total. Voted jack Trump for lack of a Vicky option. Neither compares to The Lovely Vikki. Haha not sure if serious. eraserhead wrote: Voted jack Trump for lack of a Vicky option. Now added to the poll. I want a Judd v Selby WC final. They’ll be looking towards the balcony so much that they’ll both have Cervicalgia by the end of the tournamnet. It is a good poll, but I think the answer was evident at the Masters and the NI open. Ash147 wrote: I want a Judd v Selby WC final. They’ll be looking towards the balcony so much that they’ll both have Cervicalgia by the end of the tournamnet. There needs to be a shot where suddenly a balcony is empty and it cuts to Jack with his arm around Vicky looking right at the camera. The balcony is a sacred place iranu. Selby just as he catches a glimpse of Vicky and Jack together. Ash147 wrote: Selby just as he catches a glimpse of Vicky and Jack together. Why is that referee checking out Selby's bottom? He’s taking advantage of the moment. Cloud Strife wrote: Why is that referee checking out Selby's bottom? Why is Ken Judging me? He's probably wondering why Snookerfan's hand is grabbing it. I voted for Vicky. Love her or hate her but she looks like a woman who really cares for her husband and even walk through fire for you. If I had a wife like that (I'm hoping for a much sexier version of course) I would treat her like a princess. Is it true Mourinho is in John Higgins’s corner ATM? Pink Ball wrote: Is it true Mourinho is in John Higgins’s corner ATM? There can be no other logical explanation for his downfall. What is eating Peter Ebdon ? Everyone have their weak spots also. Peter´s a bit of an explorer. That´s his. 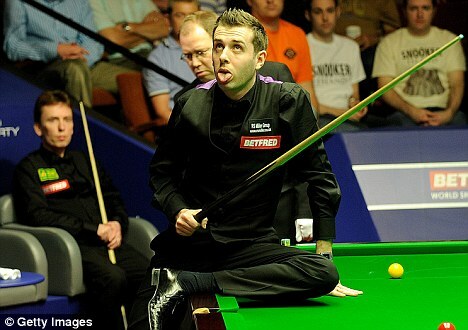 Mark Selby´s is that he´s a w@lly. And the lads like Peter also knows that. That´s also why Peter such a great lad. Selby´s got away with lots of things just because of that Jester. But realistically couldn´t quite think how the game could be promoted any worse than how Mark Selby has now done. Mark Selby could do with a new hair-cut. Or is that he even fancies to an Arabic-hero ? Arg. I am a quite restless sleeper. And everytime ready to move on immeaditely. I can´t memorize what was on the cards. And I just can´t be bothered to make that phone call in order to find out what they would gather from those. Can´t memorize any, besides just a one thing.. . But it still is a very much fans game. At times I am just mentioning a few top-players in order to make a statement that I found them interesting and basically a good lads. Just bring Christian in, but never talk about the top-players´ footballing past. That´s just pretty lame. To put it in mildly. And I now basically blame Mark Selby for it. Too. Good post Saviour - definitely a pint or two would go down well. Can someone ban this sausage head already? At this point he's clearly just being a troll. Apart from going off topic and waffling a bit he doesn't warrant a ban. Dan-cat wrote: Saviour: The Gentleman Spammer. He is a feature of the site. Ash147 wrote: Can someone ban this sausage head already? At this point he's clearly just being a troll. Judd is now starting to use his talents the way he was supposed to have been doing for some years. Not sure if his brother has anything to do with it, but Judd's working harder and has improved his safety game and shot selection. I agree. What are the mods gonna do ?